Here she is. My little beauty!! She takes such good pictures!! Okay, she broke her arm last Sunday. Sorry it has taken so long to post picture of her and her cast but her Daddy was out of town last week and had the camera with him. This is where it happened. She and Cassie made a pillow pit to fall back into off the couch. ( this is a recreation, as any good mom would do I took her to the doc. 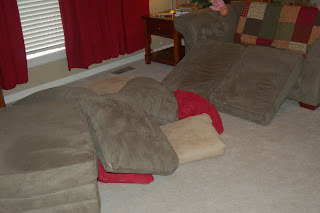 before taking pictures) Aundrea fell back into the pillows but her arm hit the floor. Here are the munchkins in the there pillow pit. Aundrea did great at the urgent care center. The ladies there were so good with her. She acted like she was having fun. 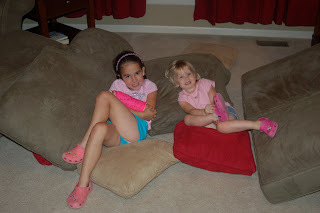 The next day we went to the pediatric orthopedic for them to determine if she needed a cast. Well you know what happened. She broke both the ulna and the radius at the wrist. She could move her wrist but it did not hurt to bad. She has been a trooper this past week. She has not let the cast slow her down. 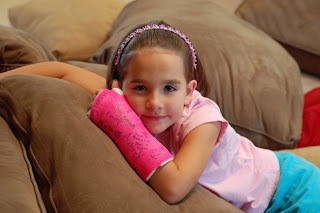 She has really enjoyed having her friends sign her cast. She has 3 more weeks to wear it and then we will go back to the doc. to see how she is doing. I'm so proud of the way she acted through out the whole ordeal.